I have done many educational projects with OpenSimulator, but EVA Park is something completely different. On this island all people are really working! 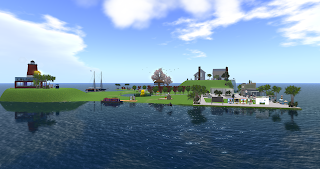 EVA Park is a multi-user online virtual world, created in OpenSimulator, that gives people with aphasia unique opportunities to practise their speech and establish social connections. It was created at City University of London, via a process of co-design where people with aphasia collaborated with researchers in human-computer interaction and speech and language therapy. 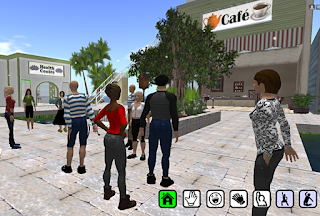 EVA Park contains a variety of virtual locations including shops, restaurants, a hairdressers, houses, a bar and disco, together with fun and fantastical elements. Users are represented by personalised avatars and communicate by talking through their headset to each other (yes they talk!). The initial study involving 20 people with aphasia showed that using EVA Park led to an improvement in functional communication. 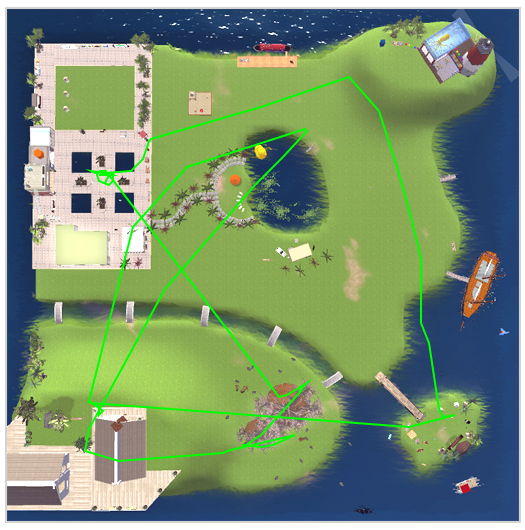 Now a new study started where groups of eight people with aphasia and four volunteers enter EVA Park all at once, to see how social interaction works with these people within this virtual world. The first session was great, so in the comming weeks EVA Park will be busy. 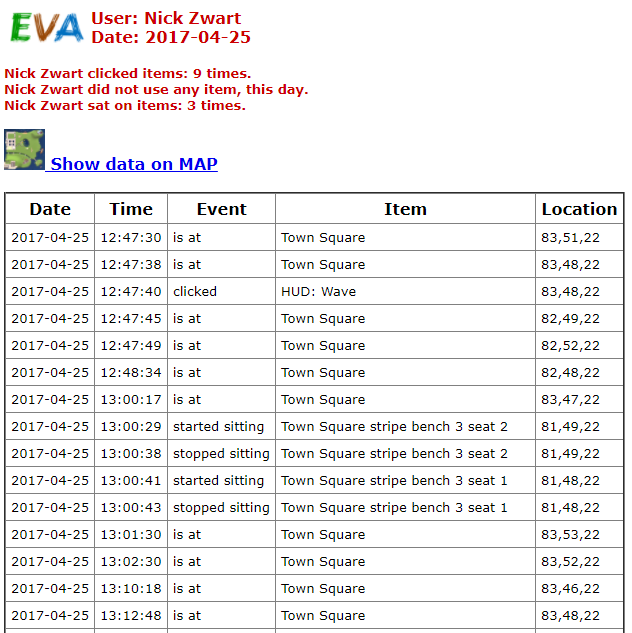 Very useful for research is that all movements are logged in EVA Park. So as soon as the user logs in, a hidden detector will send information to a script on the website that will log this information onto a database. But also when a user walks or flies around, every 30 seconds the HUD (Head Up Display) sends information about the location to the database. 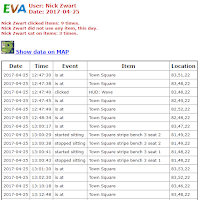 Also the interaction with objects is logged, so if a user clicks on a board, sits on a chair or clicks one of the buttons of the HUD, this event is logged, including the location and time. Very useful information for the researchers. 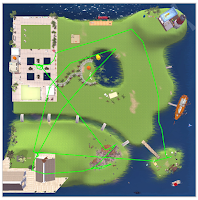 These logs can even be shown on a map of the island, thanks to HTML5 Canvas which give the option of drawing over a picture, on a webpage. The HUD is attached automatically whenever a new user logs in. A great feature of OpenSimulator called 'osForceAttachToAvatar'. And if an avatar loses his HUD, it can always be reattached by simply clicking on a box at the service desk in EVA Park. Unfortunately for outsiders, this island can not be visited, it is a closed environment where we want the people with aphasia to feel comfortable and free to do whatever they like. I like your post and stuff here .This blog is very informative .Keep doing good work, Best of luck.